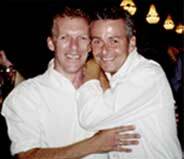 Scott Kennedy and Malcolm Vaughan have a long standing in Wellington's gay community. The couple, who first met at Mr Gay New Zealand in 1992, have been together for 26 yrs and were married in Hawaii in 2003. Having worked in the hospitality industry in many various and wonderful bars over the years, the couple pooled their talents and opened their first venture together in 1999, known as "The Dome Piano and Garden Bar" in the 'middle of the road' between Wellington's Kent and Cambridge Tce's. This was followed a year later with their second venture, Pound Nightclub and Bar, in the heart of the city on Dixon Street. After a six year stint of supplying hospitality and shows to Wellington's Gay Community, the boys took a two year (and well needed) break in order to recharge their batteries before embarking on this latest venture - now in it's eleventh year!